Mystic Crock and Mystic Crock & Andreas Miranda. 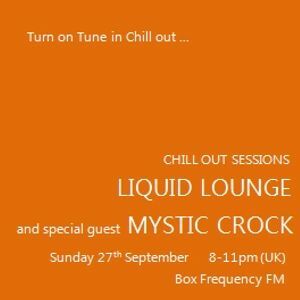 This show was 15th in the global chill out chart, 16th in the global electronica chart, 17th in the global downtempo chart, 17th in the global ambient chart and 21st in the global chillout chart. This month it was my turn to take over the reigns of the show, which featured my special guest Mystic Crock. The very talented Berlin based psybient and chill out artist / dj , who has been producing some excellent chilled and downtempo electronica and has a recorded this set exclusively for the show, which provides us with a taste of his back catalogue, new versions of current tracks and a taste of some new frequencies. Soaring at 1 hr 15. Continuing the trend of setting the bar Ian. ~ It is with deep regret that I have had to remove Mystic Crock&apos;s original set from Mixcloud and Hearthis, this was due to the inclusion of 2 unreleased tracks that are now part of contractual negotiations and discussions pending a full release with Yellow Sunshine Explosion records. However, Mr Crock kindly supplied us with a new version, omitting the 2 tracks in question and replaced them with "Earthrise" and "Nomad Drone (Remix)"